Downtown New York has lost another of its brightest lights, Clark Render. Best-known for being one half of the hilarious, long-running duo, The Dueling Bankheads, along with partner David Ilku, Render appeared in Wigstock: The Move as well as as Ghostlight –a biopic of sorts, about dance legend Martha Graham– along with countless club appearances. "Our dear, brilliant and ill-fated friend CLARK RENDER died yesterday. I met him in the "Danceteria 80s" where so many of our lifelong friends were made. I was a bartender and Clark my ‘cocktail hateress"‘ Beginning with his incarnation there as DIXIE, The Danceteria Lady and continuing through the entire decade of JACKIE 60, where he played so many roles to perfection - to his appearances at LOW LIFE and finally GHOSTLIGHT a few years back, he was a treasured friend and collaborator. Most famously as one-half of the DUELING BANKHEADS with David Ilku, he was side-splittingly funny - after a backstage evening with Clark I often had the same abdominal pains as after doing crunches.. THAT funny!" 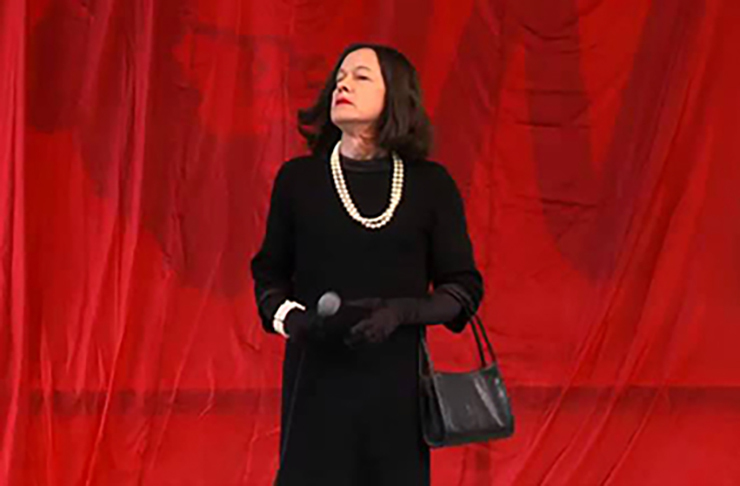 Fellow performer, Nora Burns, posted an early video of Render as Margaret Thatcher that shows his raw talent, intelligence, deadpan delivery and outrage that fueled many of Render’s performances. An early World of Wonder Production, U.S. TV that ran on BBC4 in England, showcased the cracked sensibility the DB’s possessed, even with just one phrase as material.